Sarah Clark Stuart, executive director of the Bicycle Coalition of Greater Philadelphia. Sarah Clark Stuart is the executive director of the Bicycle Coalition of Greater Philadelphia. 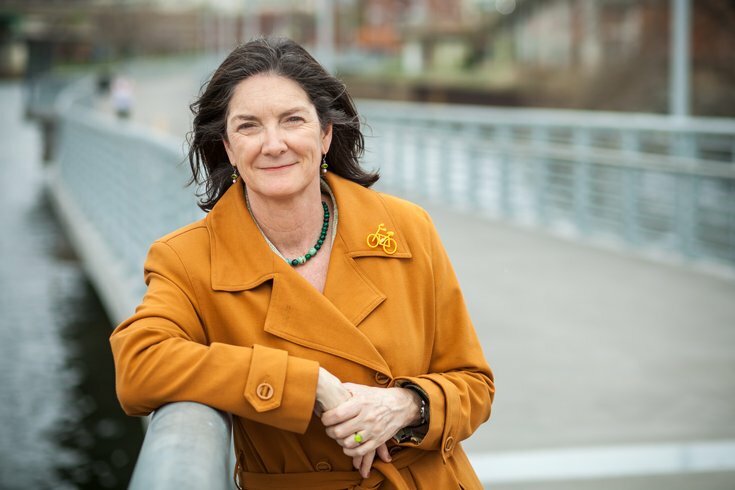 She has led the way in building and connecting trails in the Philadelphia region. 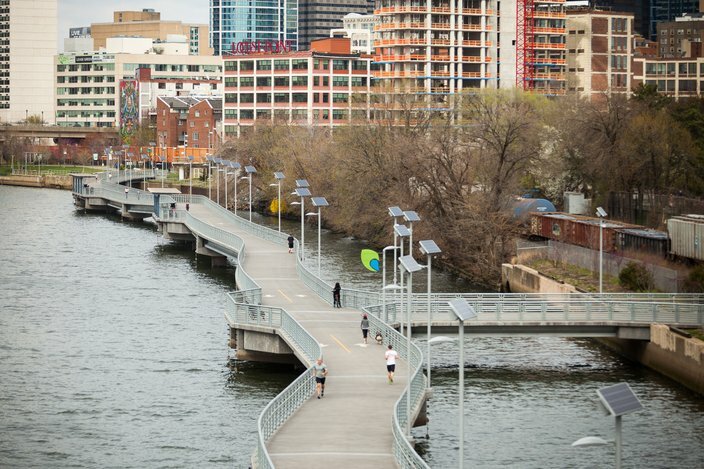 The next time you take the Schuylkill Banks Boardwalk on your jog to Boathouse Row or explore the regional trail network by bike, you will know a bit more about how those segments and connections came to be there. And you should thank Sarah. What did you do before you were a bicycle advocate? I started off in my career as an environmental science advocate. When I moved to Philadelphia in 1995, I worked primarily on issues outside Philadelphia, but when I started to have children and I didn't want to travel anymore, I looked around for opportunities to work closer to home. I stumbled on a campaign that landed right at my feet. I live in West Center City, and when ground was broken to build Schuylkill Banks, it became apparent that there was a very large chance that the street-level access might be closed off because of a disagreement between the city of Philadelphia and CSX railroad. How did you get involved with Schuylkill Banks? I got involved with my late husband Rob Stuart and Russell Meddin and others to create a citizens' campaign to keep the two at-grade crossings at Race and Locust streets open — for them to be protected and made safe. So, that was our position, and we ran a campaign to achieve that goal, and three years later, we did. The city of Philadelphia and CSX settled a lawsuit, which created the Race and Locust street crossings and made them safe. The city also agreed to build a bridge in what was called "in the vicinity of Locust Street." The Schuylkill Banks Boardwalk as seen from the South Street Bridge. That campaign introduced me to the bicycling community and the bicycle advocacy community, to City Council members and to the civic community in Philadelphia. The more I got involved, the more I was attracted to playing a role and impacting the infrastructure of roads and trails in and around Philadelphia. With time, I was able to bring support to the Bicycle Coalition of Greater Philadelphia so that I could work for the Coalition full time. How did organizations come together to work on the Schuylkill River Trail? Subsequently, I was able to help knit together organizations that were working on the Schuylkill River Trail (SRT), and we created a campaign called Complete the Schuylkill River Trail. This led to a big opportunity to seek federal funding for trail projects in the region; I worked with the Pennsylvania Environmental Council and people from the city of Philadelphia to prepare a proposal for a big grant to fund trails across many counties. Ultimately, the federal government decided to give Philadelphia and Camden each funding to build 10 different trail segments. One of those happened to be that bridge over the railroad tracks that the city was obliged to build. It also put money toward the boardwalk, other parts of the SRT, the Port Richmond Trail, the 58th Street Greenway, the trail in Bartram's Garden, as well as some trail segments in Camden. That catalyzed the rebranding of the regional trail network as The Circuit. It leveraged other funding from the William Penn Foundation and the state of Pennsylvania and, ultimately, a little bit of money from New Jersey. So there was a renaissance of trail building that started in 2010. Since I've been here, it's taken a considerable amount of time to keep at that and to continue that momentum with funding from the states or the federal government to build more trails and more segments. And that's why this work is so satisfying because you can see the results of your effort in full knowledge that it is the work of many people and many institutions. You can actually see change and progress. It's enormously gratifying to see new infrastructure and new policies. 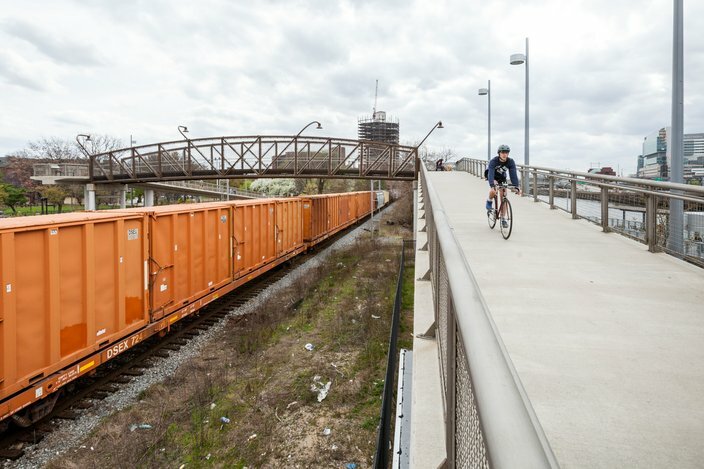 The Schuylkill River Parks Connector Bridge allows trail users to easily cross over the train tracks that parallel parts of the Schuylkill Banks path. What other projects have made or will make the biggest changes? The Schuylkill Banks and the Spruce and Pine Street buffered bike lanes changed biking in Center City significantly because they encouraged a lot more people to bike longer distances and feel safer. The Chester Valley Trail, the section of the Pennypack Trail in Montgomery County, the improvements of the Cooper River Trail have had a transformative impact locally. Extending the boardwalk from Christian Street to the Grays Ferry Crescent will make a dramatic impact to Southwest Philadelphia, creating an offroad, seamless connection all the way into Center City. What can Philadelphia residents do to improve biking? We are encouraging people to look at the Bike Lane Toolkit and sign the petition so that we can bring their point of view to both City Council members and the Streets Department. That's expressing support for streets that are supposed to have bike lanes. Infrequently Asked Questions: Do bike helmets have expiration dates? Bike to Work Day is coming up on Friday, May 20, and we encourage people to sign up, join us and invite others to ride to work with us that day. We're going to have “service stations” with free coffee and swag along selected bike lanes, and we will be excited to welcome you on your commute to work. I think the best thing that people can do is to join the Bicycle Coalition, because that way you keep in touch with and get alerted by our Cyclegram that goes out every two weeks about what’s happening in and outside Philadelphia. Membership supports the work of our advocates. We need your help to continue the efforts that we're making to make this kind of long-term change to repurpose and recycle road and railbed infrastructure and to build a network that works for people who want to walk and bike, for fun or for transportation.